A new limited edition from essence that let you feel the summer mood! This collection contains products that are inspired by the beauty products from the middle east. So think about bright colors, ethnic patterns and everything for a beautiful tanned skin! I bought 3 products from this amazing collection that gave me directly summer and festival vibes! Are you curious? The first item is something simple but so nice! Namely nail stickers! Normally I wouldn’t buy this, but I really love ethnic patterns to pimp your manicure! It gives your nails something extra! These nail stickers are beautiful on a sweet summery color or on white! How to use? You start with painting your nails with the color you want, when this is dry you bring on the sticker on the nail you want. You can do this with tweezers, this makes your work a bit easier. When the sticker is placed where you want you can work it off with a top coat. And that is it for a cool summer manicure with ethnic details! These body tattoos ethnic inspired are just a must for on the festivals! These tattoos are so elegantly. These come in gold, black and in cyan. You can directly feel the ethnic vibes with these! It are amazing tattoos, that give your outfit something extra! This is the perfect body lotion to let you sparkle this summer! It’s a good body lotion that smells a bit fresh and also sweet. It directly blend into the skin and gives it a subtle glitter/healthy glow. It’s an amazing product to let your legs and arms sparkle in that one outfit. I’m for sure fan from this body lotion especially from the pretty glow that it gives and also because it makes my skin so soft! It’s an amazing product! So good job essence, especially for that price! 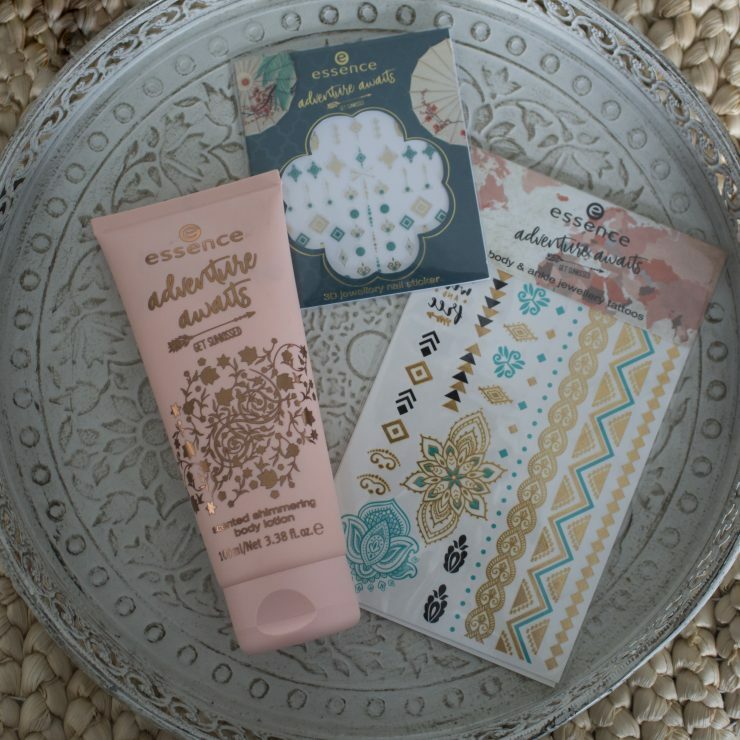 I’m fan from this lovely collection with beautiful patterns! The tattoos and nail stickers are so cool to pimp your look. But also the body lotion gives you a beautiful shimmering skin! If you ask me are these products perfect for this (festival) summer!